Improved Therapeutic Design: Comfortable Seat Cushioning with curved design and standardized hollow ventilating space that gives support to the Coccyx. Uses: This pillow is of universal size to match almost everyone while sitting on Car Seats, Wheel Chairs, Office Chairs, and Upright Chairs. Super-soft, machine washable and easily removable knit cover. This pillow is hypoallergenic and dust mite resistant. Shape: Angled wedge design provides soothing support to the pelvis, minimizing strain on the lower spine. It reinstates the relief to spinal discs and lumbar curve. The Coccyx pillows are the best in providing orthopedic support by keeping your spine base aligned and makes your tailbone stay free from pain. These pillows are the best support for those who work for long hours sitting on a chair or traveling. People start slouching after some time if they continue to sit in the same position for a longer time. This creates undue pressure on the lower back and causes inflammation in the associated muscles. 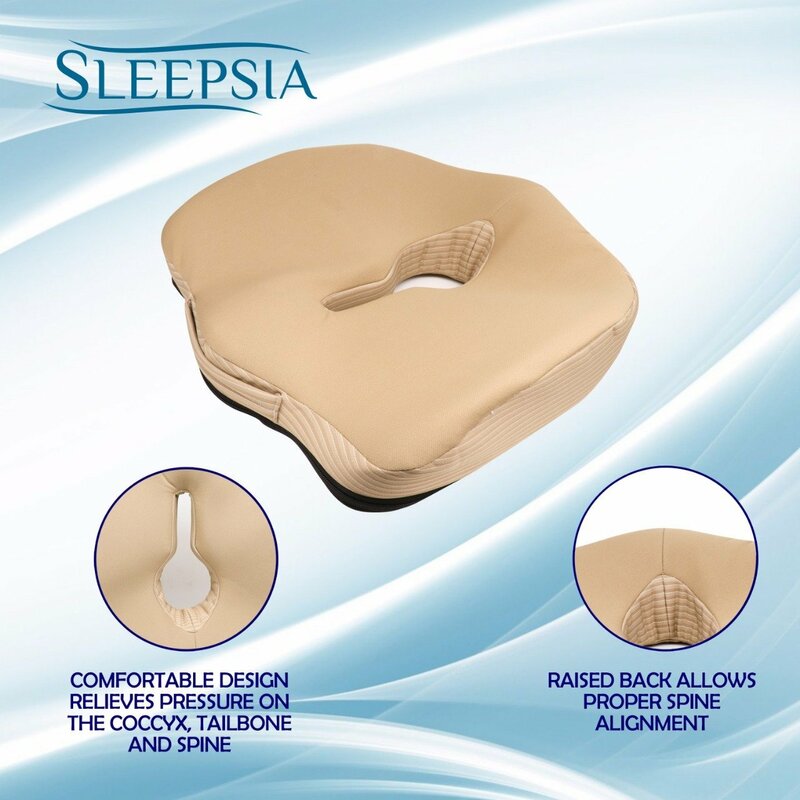 The Angled wedge design of our Coccyx pillow provides soothing support to the pelvis and keeps it elevated to maintain an upright spine. People with orthopedic problems suffer due to multiple reasons like accidental injury, tumors, infections, childbirth, long work hours that causes inflammation of the muscle around the lower back eventually leading to chronic pain and aches. Anti-inflammatory treatment and pain management don’t serve any long-term goal. 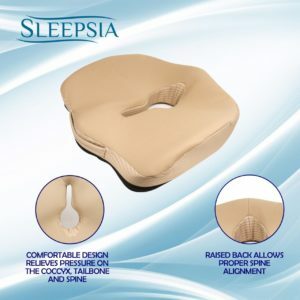 Coccyx pillows are particularly helpful in these cases as these are specially designed to relieve the spin base and other pressure points on tailbone and lumber and provide relief in orthopedic conditions. Your ongoing pain level will be reduced noticeably and it will provide the much needed relief after sitting for a long period by increasing the blood flow to the legs. Coccyx pillows also aid better support and pain relief in other conditions like herniated discs problems, tailbone injuries, sciatica, and other spinal issues. These pillows are great for office, home, train & airplane travel, car seat or wheelchair use and they come in a universal size to match every seat like the wheelchairs, office chairs, rocking chairs and upright chairs. 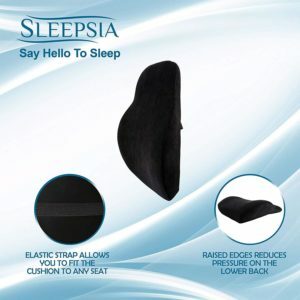 Sleepsia Coccyx Orthopedic Foam Seat Cushion use a premium quality durable memory foam that never goes flat and are hypoallergenic, dust and mite resistant. 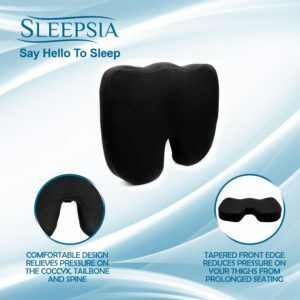 Sleepsia Coccyx Orthopedic Foam Pillows come in attractive colors like beige and a combination of black & green. They also make for a unique gift for recovering patients, long haul drivers, business traveler, yoga and meditation practitioners, or even for sitting on the floor with kids.